Try our PU polyurethane universal wheel Wheels from now on, ALL YOUR FLOORS WILL BE SAFE. The inexpensive plastic chair wheels you are using leave scratches on your expensive floor. Every time we move the chair, there is a lot of noise, which hinders efficient work. Inter-floor noise can also occur, which can make the neighborhood and the neighborhood worse. You will find dirt and hair on the long-used chair wheels. 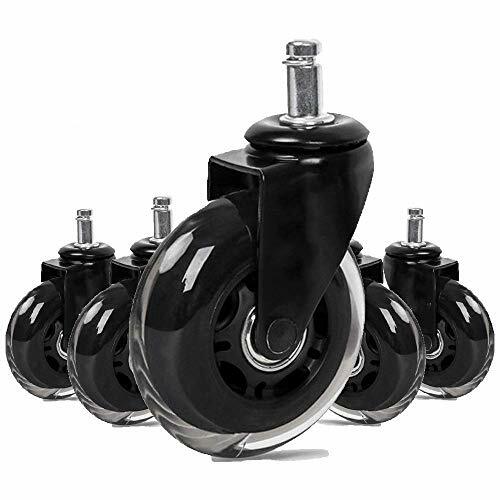 - our chair wheels can protect wood, hardwood, laminate tile. - You do not need a chair mat anymore. - You can easily replace without tools. - Some compatible brands include: Herman Miller Aeron, Steelcase, dxracer, Humanscale Freedom, Lazyboy Serta, Hon, Boss, and more. - smooth rotating with upper and lower beearings provide silent and smooth rolling. - Easy replacement without tools. - High Weight Capacity (650lbs), Tangle-Free, and Years of Durability.